Immediately we look at these words of Jesus, we find them the most revolutionary statement human ears ever listened to. 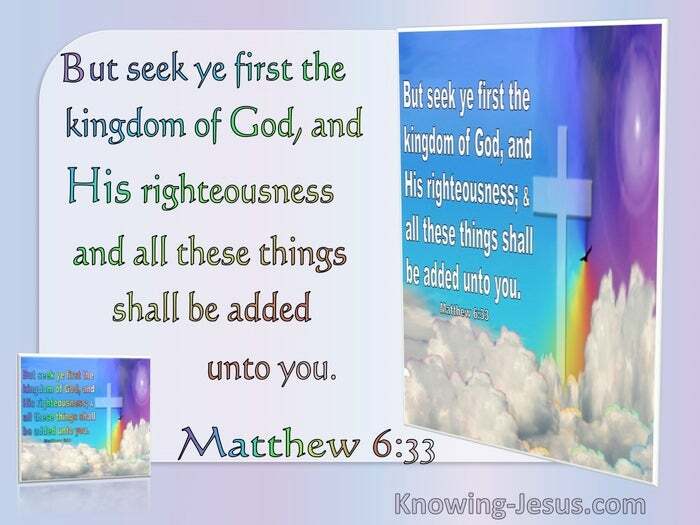 "Seek ye first the kingdom of God." We argue in exactly the opposite way, even the most spiritually-minded of us - "But I must live; I must make so much money; I must be clothed; I must be fed." The great concern of our lives is not the kingdom of God, but how we are to fit ourselves to live. Jesus reverses the order: Get rightly related to God first, maintain that as the great care of your life, and never put the concern of your care on the other things. "Take no thought for your life. . . ." Our Lord points out the utter unreasonableness from His standpoint of being so anxious over the means of living. Jesus is not saying that the man who takes thought for nothing is blessed - that man is a fool. Jesus taught that a disciple has to make his relationship to God the dominating concentration of his life, and to be carefully careless about every thing else in comparison to that. Jesus is saying - "Don't make the ruling factor of your life what you shall eat and what you shall drink, but be concentrated absolutely on God." Some people are careless over what they eat and drink, and they suffer for it; they are careless about what they wear, and they look as they have no business to look; they are careless about their earthly affairs, and God holds them responsible. Jesus is saying that the great care of life is to put the relationship of God first, and everything else second. 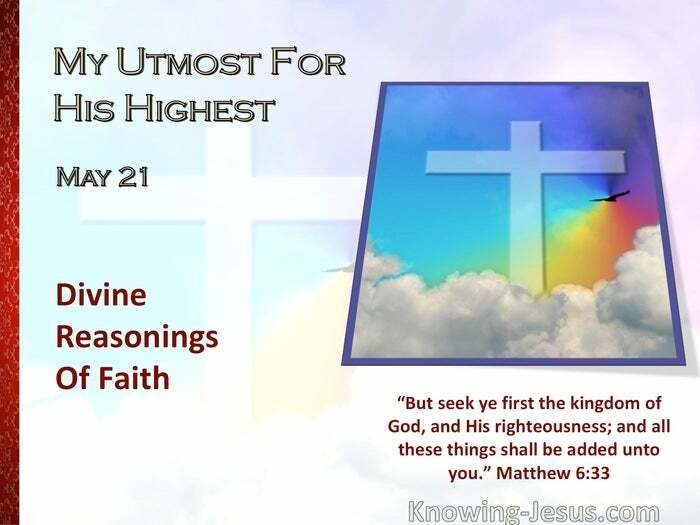 It is one of the severest disciplines of the Christian life to allow the Holy Spirit to bring us into harmony with the teaching of Jesus in these verses.